Recipe testing, new yoga class and post-half-marathon high, OH MY! PETA Pack for the win! This past month has brought many highs amidst a devastating low. I completed my first half-marathon, despite my stupid knee acting up, and it was one of the greatest personal accomplishments EVER. I raised 750$ for PETA, and completed the race 30 minutes shy of my expected time! 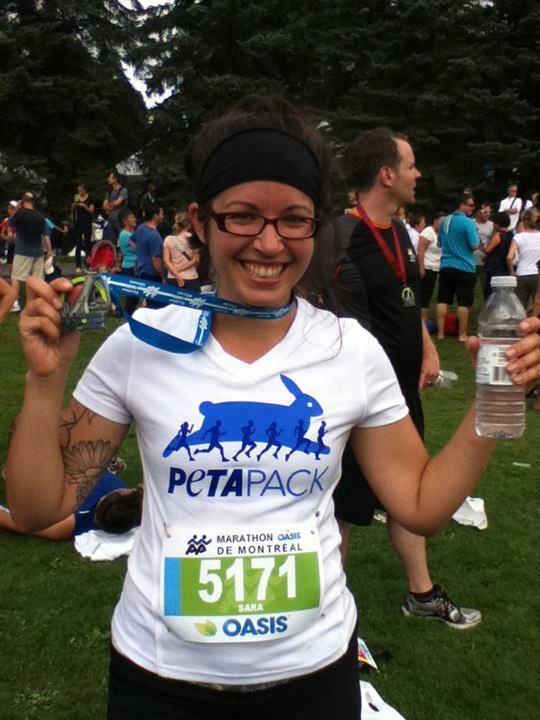 Not only was my experience with PETA Pack an incredible one, but the organization and efficiency of the Oasis Marathon organizers and volunteers made Race Day a very special, smooth and inclusive event for everyone. To all my friends and family: if anyone is interested in joining the team next year, please let me know! Let’s start training early, together, and run the race as a group! As much as i enjoyed my pre-race training, i was happy and excited to return to my yoga practice. When i started training for the half-M, i vowed to continue practicing yoga on a daily basis. I failed. My practice dwindled to once a week (if i was lucky). It was gross. I was gross. My hips were tight, my shoulders were stiff, and i was kind of an emotional wreck. Adding to this was the fact that i was teaching 2 classes a week, which made me feel like a yogic hypocrite. As i entered Moksha yoga for my first class back in 3 months, a look of shame was clearly written all over my face. Even before we prepared for our first downward dog, i knew this class would be a disaster. A wonderful, eye-opening, sweaty disaster, but a disaster nonetheless. By the end of that class, i left the studio with shaking arms, a sore core and the biggest smile ever on my face. I had returned home. Just like returning home after an extended absence, the familiarity of the practice was there, but it was surrounded by change. I embraced the shaking of my legs in Warrior 2, I relished in the screaming of my hips during any and every forward bend we went into. There was so much stiffness in my body, so many points of tension. I felt like i was rediscovering yoga asana all over again. And it was awesome. Though i initially felt frustration at having let my practice slip during training, i have begun to discover that taking a step back, to then revisit my practice, has offered me a whole new journey of self-exploration. Reuniting with my asana practice has been a welcome addition to my weekly schedule, as has the addition of a morning yoga class to my teaching schedule. Starting next week (November 2nd) I will be teaching a morning yoga class at FlowSpace, a wonderful space in the historic Union Francaise building. If you or anyone in your circle is interested in yoga before work, this class is for you. I’m hoping its proximity to the downtown core will attract 9-to-5ers, as us office workers can always benefit from the awesomeness of yoga! (I don’t know about you, but Computers give me Stiff Shoulders.) It’s better than coffee, i swear! For a look at my complete teaching schedule, please click on the option under the “About” header. On the food front, I’ve signed on to test recipes for one of my favorite vegan cookbook authors, Terry Hope Romero. I’ll be posting lots of food pics once i start testing; I’m really looking forward to getting started! To celebrate Halloween, i have tried incorporating pumpkin into soup and desserts. The soup (roasted pumpkin soup) was awesome, the dessert (pumpkin brownies) was a huge fail. I literally had to scrape the pumpkin layer off the brownie crust and throw it out, so as to salvage the brownie part. It was messy to make, messy to eat, and messy to dispose of. I should have known better than to try and change a good thing; brownies are the cat’s pajamas on their own, with no need for a layer of gelatinous pumpkin to dress them up. The soup, however, was warming and spicy; perfect for crisp fall lunches. While the pumpkin is roasting, prep your other ingredients. Chop onion into little pieces. Peel sweet and regular potatoes, and chop into small pieces. Peel and chop carrot into small pieces. Once pumpkin is ready, get out your favorite soup pot. Cover the bottom with a couple of swooshes of olive oil. Throw in the onion. Cook the onion on med-high heat for 5 minutes, until soft. While the onion is cooking, scoop out the flesh from the pumpkin, discarding the skin. Put in a bowl and reserve. In your soup pot, throw in the carrots and cook for a couple of minutes more. Throw in the potatoes, lentils and pumpkin. Take your sweet, delicious roasted garlic bulbs. Grab the bulb halves from the top and squeeze the bulbs out of their skin into the pot. Add all the spices and cover with broth. Turn the heat to med-low and let simmer, partially-covered, for at least 45 minutes. Once the potatoes are tender, you are ready to mash this soup into potage form. Take the cauldron off the heat and grab your handheld masher (electric or potato masher). Mash the soup until it reaches a creamy consistency, or leave it a little lumpy if that’s your thing. Put pot back on heat, and heat soup on med-low heat for another 10 minutes. Remove from heat and enjoy! You can sprinkle pumpkin seeds or walnuts on top before serving, it gives the soup a delicious crunch. I wonder if our neighborhood will get many trick-or-treaters? I wonder if the trick-or-treaters will stage a mutiny against me if i give out vegan fruit chews or carrot sticks? Yoga AND Sailing? Yes please! Breakouts are so 10 years ago.